Leonid Afremov ®(born 12 July 1955 in Vitebsk, Belarus) is a Russian–Israeli modern impressionistic artist who works mainly with a palette knife and oils. He developed his own unique technique and style which is unmistakable and cannot be confused with other artists. Afremov is mainly known as being a self-representing artist who promotes and sells his work exclusively over the internet with very little exhibitions and involvement of dealers and galleries. Afremov was a good student in school and was interested in history and art. He attended all the possible art classes offered in school and took private lessons from local artists. Leonid’s parents noticed his talent for painting at an early age and encouraged him to develop his talents. 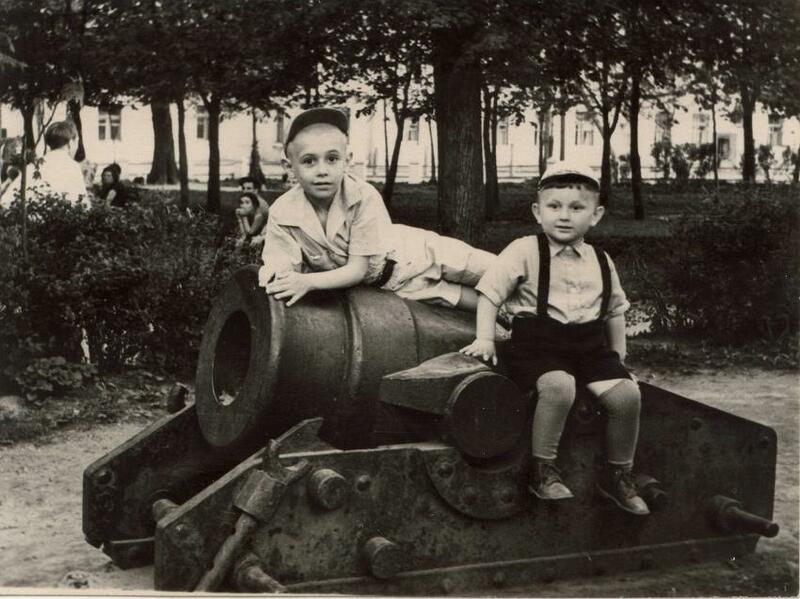 At the age of 14 Leonid was exposed to extreme cold which resulted in kidney damage. Later in life the kidney damage resulted in hypertension which he still struggles with to this day. In 1973 Leonid Afremov graduated with honor from high school in Vitebsk and was admitted to the Vitebsk Education Institute where he studied in the arts and graphics department. During his years in college, Afremov was introduced to the work of March Chagall, Picasso, Dali, Modigliani and the 19th century French Impressionism. His early artistic work was very influenced by Chagall and Modigliani. During his years in college, Afremov participated in various school exhibitions and even sold some paintings. In 1978 Afremov graduated from the Vitebsk Art School as one of their elite members. After that he took private lessons from local famous artist Barowski who was teaching art when Marc Chagall was still living in Vitebsk. In 1975 Afremov met his wife to be, Inessa Kagan, who he married the following year. In 1977 his first son Dmitry was born. The young family lived in a 2 room apartment together with Inessa’s parents, grandmother and sister. In 1982 they bought their own home where they lived until 1990. After graduating from college, Afremov worked as a label designer in a local beer and liquor factory. Then he briefly worked in a local theater as a set designer. In the early 1980’s he started doing free lance work for communal farms and schools, designing and making various propaganda posters, themed rooms and walls for certain communist events and holidays. He was also doing template sculptures of Lenin from plaster. He had a very good reputation in that field and was invited back by many farms and schools. This type of work was available only during the summer and spring. In November 1984 his second son Boris was born. 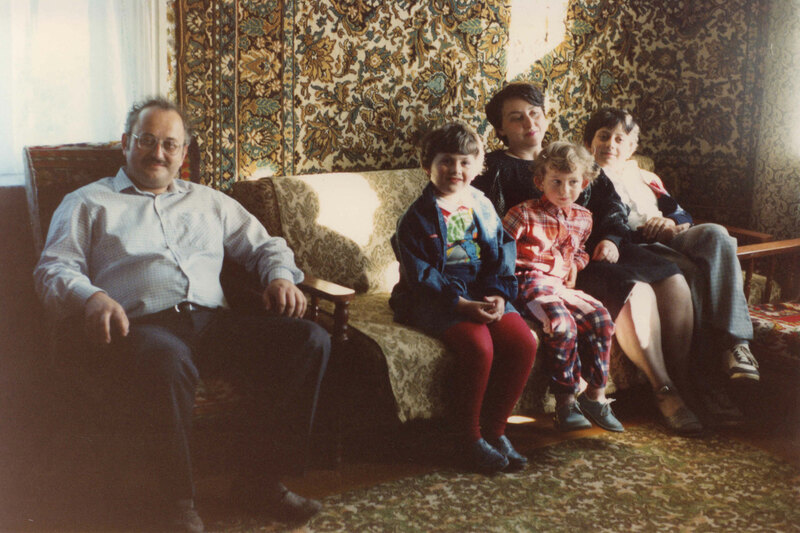 Leonid on the left with family 1989. During the cold Russian winter, Afremov stayed at home painting. He was not allowed to participate in government exhibitions because of his Jewish roots and was not allowed to be a member of the local art associations. His early work was sold privately via family and friends and was not seen by many people. A lot of his work in the 1980’s was just given away for free. He did not keep records of his work then and not much of it survived. He currently does not have pictures of anything before 1990. In 1986 the Chernobyl disaster happened. Vitebsk was only a few hundred kilometers from Chernobyl, close enough for radiation to travel with the wind and rain. The ecological situation in the area worsened, local crops and water becoming contaminated with radioactive fallout. Small children were affected strongly, including Afremov's two year old son. At the same time Leonid Afremov was experiencing serious discrimination and insults for his Jewish heritage. The liberal politics of Mikhail Gorbachev allowed Jewish soviet citizens to migrate to Israel in the late 1980s. After being fed up with anti-semitism and problems caused by radiation, Leonid decided to move to Israel without hesitation as soon as the doors were opened. On 14 May 1990 the Afremov family left by train from Minsk to Warsaw where they stayed in a hostel for 3 days. Then on 17 May 1990 they took a flight to Israel provided by the Israeli immigration authorities. The Afremov family was among the first to migrate from USSR in the Russian–Jewish immigration wave of the 1990s. On 17 May 1990 the Afremov family entered Israel in Ben Gurion International Airport. They had to give up their Soviet citizenship in favor of Israeli. To this day, Leonid Afremov and his family are citizens of Israel only. The Afremovs had some family in Israel who had lived there since the 1970s and 1980s. Said family rented an apartment for them in Ramat-Gan and helped them to start their new life in Israel. A few weeks after moving to Israel, Leonid Afremov found a job in an advertisement agency making signs and posters. After working in an advertisement agency, he worked in a gallery shop where he learned to make frames, being introduced to the palette knife for the first time. Because he was a recent Russian immigrant, the locals considered his work as having little value. Galleries took paintings for 50 shekels (15USD) and were reselling them for 500 to 5000 shekels. When Leonid confronted galleries about the extremely low prices, he always received the same answer: "you a Russian immigrant, you a new piece of junk, (sic) you have no choice." The galleries refused to sell his work for percentage commissions just because he was a Russian immigrant. He was only given the option of a pittance for each painting which took a day to make. Afremov felt like he was exploited and discriminated by the galleries and the Israeli society just like he was by the Soviet Government. He attemped to sell at street fairs and exhibitions in local social clubs. However, it was difficult because of the social stigma of Russian immigrants. His wife was forced to take a low-paying job in a textile factory. During the early 1990s, Leonid Afremov was mainly working with watercolors and acrylic. He was experimenting very little with usage of the palette knife. He was painting what people were buying, with very little artistic freedom. In 1993, the Afremov family bought an apartment in Ashdod because it was a city of mainly Russian immigrants. Leonid Afremov hoped to avoid constant insults and discrimination by moving to a place where mainly Russians live. However, the city was primarily residential, without many opportunities, and Afremov had no choice but to keep dealing with the locals from the Tel Aviv area. In 1994, out of extreme desperation, his 16-year-old son Dmitry tried to sell Leonid’s paintings door to door around the neighborhood, This practice proved itself very effective, and Afremov suddenly started selling many pieces he painted and was getting slightly better money than from selling directly to galleries. Dmitry proved himself to be a good door-to-door salesman. He was selling Leonid’s paintings in the new neighborhoods where recent Russian Immigrants were living. In 1995, Leonid acquired enough funds to open his own gallery and frame shop in Ashdod. The gallery was not popular among local Israelis; it was mainly visited by fellow Russian immigrants. The gallery was vandalized and broken into on several occasions. The local Israeli newspapers were refusing to publish advertisements for Afremov's Gallery, and he was mainly advertising via Russian immigrant press and radio station. However, artistic freedom could not be achieved completely. During the late 1990s, Leonid was constantly holding exhibitions in Russian community centers around Israel; everywhere else the doors were closed because he was a Russian immigrant. During this time he already worked mainly with a palette knife and oils, he began establishing a unique artistic identity, however it was difficult to paint what he wanted because of the financial obligations and the picky customers. Around 1999, Leonid became friends with Russian-speaking Israeli jazz musician Leonid Ptashka, who inspired Afremov to paint a collection of portraits of popular jazz musicians and helped him secure a successful exhibition in the International Jazz Festival in Ashdod. Since then, Leonid Afremov has painted dozens of his favorite musicians. In March 2001, Afremov's gallery was completely vandalized. Dozens of paintings were destroyed, the artistic equipment stolen and the facility turned into rubble. Then Leonid decided it was time to move somewhere else where he could be treated with deserved respect, eventually moving to the USA in January 2002. Leonid Afremov was preparing his move to USA very carefully. For several months he did not sell any paintings, everything he painted he sent to his sister in Brooklyn. When he arrived in the US in January 2002, he had more than one hundred paintings at his disposal. Him and his son were systematically going from one gallery to another in New York. They found galleries that liked and purchased paintings, however they only took what kind of judaic themes and musician portraits. Afremov found himself forced to paint only limited themes and subjects for living. Leonid had good opportunities in New York but the cold climate affected his health. He was constantly struggling with arthritis and muscular pain caused by drastic temperature changes. Thus he moved to Fort Lauderdale in April 2002, The rest of the family joined him a few months later. 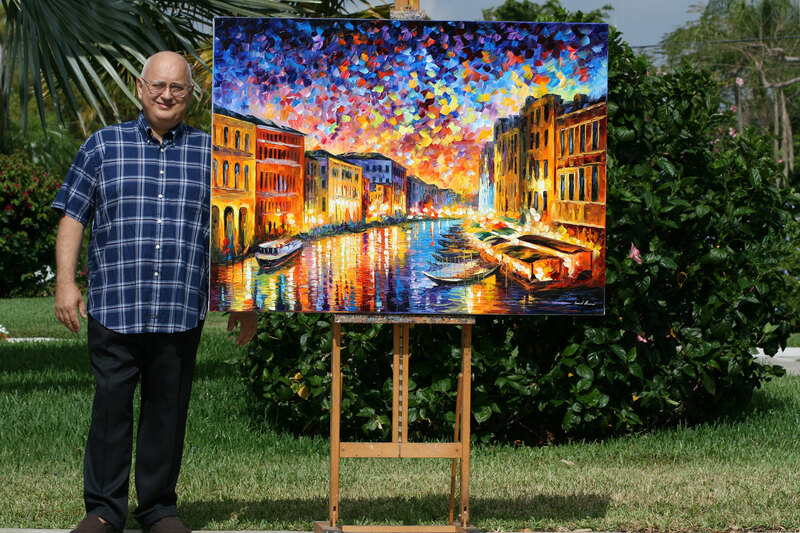 In Florida, Afremov faced the same changeless like in New York, selling only certain themes and subjects that the galleries wanted and were able to sell. In 2004, after graduating high school, Leonid’s son Boris was introduced to ebay by his friends. They tried to sell a couple of paintings by auction and immediately received positive approval. Paintings were sold for hundreds and sometimes thousands of dollars and everything sold without exception. For the first time Afremov was given the opportunity to paint what he really wanted. At this point the real artistic journey began. He began painting what he really wanted from his personal inspirations and finally was able to explore his artistic vision and abilities all the way. The exposure on eBay gave him opportunities for commission orders and access to different galleries. However, because of negative experiences with galleries, Leonid preferred to sell directly to the collector. Thanks to the internet exposure, Afremov participated in various local TV shows around the USA. His art was declared very relaxing and calm by notable psychologists and psychiatrists who make use of his painting in various psychological and psychiatric therapy procedures. Afremov's paintings were published not only in art magazines but also in various medical and health magazines as examples of stress reducing paintings. In 2005 following a successful year, the Afremov family moved to Boca Raton. In the same year, they started taking their first family vacations in Cancun and Playa del Carmen. In 2007 with the help of his sons Leonid lunched his own personal site where he began selling giclees, prints and original painting, eventually moving all the business and attantion to his personal site. Two years later Leonid underwent heart bypass procedures. The doctors recommended Leonid to stay away from managing a business, keep a calm lifestyle and ultimately retire. Since then his sons Boris and Dmitry have been handling his sales and business aspects like customer service and shipping. Leonid Afremov with his painting Venice Grand Canal. In 2005 Leonid Afremov vacationed in Playa del Carmen and Cancun for the first time. Since then he was visiting the Mexican Caribbean 2 to 3 times a year and completely fell in love with the area. Eventually in March 2010 Leonid decided to take on early retirement recommended by his doctors and moved to Playa del Carmen, a popular resort town near Cancun. His children were involved in his business to the point that they had to move to Mexico as well. His children manage his virtual gallery and shipping office in Playa del Carmen. The Afremovs also have locations in Cancun and Cozumel where they sell art during the busy tourist season in the winter. Leonid found Caribbean Mexico very relaxing and stress free to spend his time painting. In 2011 Leonid sponsored the construction of his own personal ranch near Puerto Morelos where he spends much of his time. Leonid Afremov keeps the majority of his art politically neutral. His paintings are not offensive to anyone nor send any hidden messages. The paintings usually reflect certain personal memories and emotions. Leonid Afremov tries to draw the viewer to have a certain feeling rather than tell a story via the painting, or have the viewer see the world how he sees it. The neutral attributes of Afremov’s art make the paintings appealing to almost any social, ethnic and age group. Leonid Afremov has been traveling quite extensively and has taken many photographs of different scenes that he later painted. Almost every painting he painted has a very personal inspiration. His art can be reflected as very positive through the bright colors he uses. Leonid Afremov loves cats and other animals; he has had cats throughout his entire life. He has painted many paintings of cats, dogs, horses, tigers and even giraffes. The only political paintings he has are of bull-fighting , where he tries to show the viewer the cruel nature of the sport and discourage the viewers from liking bull-fighting. Human mind works in a peculiar way: we tend to cling to the past and be overcritical about the present. That’s why modern art often comes under attack. We compare new creations with classic masterpieces and seek out the smallest flaws. Perhaps the grass used to be greener a few centuries but it doesn’t mean that talented people stopped being born in our lifetime! Here is a living illustration – Leonid Afremov. After reading Leonid Afremov’s bio, one can easily imagine how he has become what he is now. Struggling for his individuality and artistic freedom, he managed to create his own style based on the experience of the most outstanding artists. While Afremov’s early works are influenced by the masterpieces of older painters, his mature artwork is very unique and recognizable. According to Mr. Afremov, art is not something elite, understandable for a small circle of intellectuals only. He doesn’t want to put any complicated hidden messages into his work – on the contrary, he wants his paintings to be intuitively close to everyone. When one looks at these autumn parks, lantern-lit alleys and vibrant cityscapes, the idea is rather clear. The artist invites to the world of simple beauty which constantly surrounds us, but we are too busy to stop for a moment and enjoy it. If a painting helps someone to realize that, it wasn’t created in vain. Mr. Afremov proves that elegancy and delicacy of the art aren’t really gone. While many other artists try to shock the public with something slangy, this painter respects traditions. He doesn’t follow them automatically but takes the best from every style. Modern wall art can be meaningful and clear to the public – that’s the idea of his paintings. Here everyone will find a painting that will touch their heart and make their apartment more individual. These examples of modern art will demonstrate the delicate taste of the owner just as fine as a piece of classic art.